It could all have been so different for Wales wing Alex Cuthbert. He might have tried his sporting luck as a footballer or followed his passion for showjumping. And after plumping for the oval ball the 6ft 6in, 16st 5lb Gloucester-born 21-year-old could have been lining up for England against Wales at Twickenham on Saturday. Would he have taken that course and followed the land of his father and birth instead of his mother's nation? "Never," is the unequivocal, instant response from the player who scored his first Wales try in their 27-13 win over Scotland on 12 February, and it may be easy to understand why. Following a rugby grounding under former Wales backs coach Allan Lewis at Hartpury College, Gloucestershire, Cuthbert moved to what is now Cardiff Metropolitan University, formerly Uwic. From there, Wales Sevens coach Paul John took a serious interest, fielding the late-starter in the IRB World Series. Now Cuthbert finds himself bidding to fulfil two ambitions. The first, and most immediate, is to help Wales win the Triple Crown on English soil for the first time. Cuthbert's longer-term goal is to establish himself in the Welsh team in the wake of Shane Williams' retirement. However, the Cardiff Blue admits the thought of playing against the nation of his birth "obviously adds a bit of extra spice" to what lies ahead in London. Having been brought into the Wales Sevens set-up by John, Cuthbert's rise to Test prominence has been unconventional. There were no age-grade caps to savour and little in the way of those-in-the-know heralding the impending arrival of a new star. But here he is, hoping to help Wales achieve a slice of history in one of the biggest, youngest and least experienced Welsh back divisions to have taken on such a task. 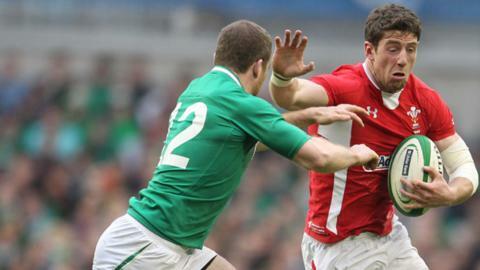 Cuthbert is two years senior to Wales' other giant wing, 19-year-old George North, but has 15 fewer caps. North himself could have been lining up for England, born as he was in King's Lynn to cross-border parents. Ditto centre Jonathan Davies, 23, and like North a Welsh-speaker and a Scarlet, but who was born in Solihull in the same year that his namesake, the BBC pundit Jonathan Davies, enjoyed a Triple Crown year as Wales' fly-half - 1988. For Cuthbert, the mere fact that he is lining up against England is a joy after setting his sights rather lower ahead of the season. "England have a big forward pack and are physical at the breakdowns. They like to kick quite a lot, really, which is a little bit like Ireland, but totally different to Scotland," he said. "I've been watching it [the Five/Six Nations] on the TV since I was a kid and playing against England for the Triple Crown is a great honour, really. "The way I started at the Blues, I was only hoping to maybe be involved with the seniors at the start of the year, which was one of my main aims. "I was a footballer from a young age, really, and got to a level where I thought I was going to go not so high and, in college, I started playing rugby a bit and decided I'd give this a go and I've gone through the ranks in the last few years." Those he now lines up with include Jamie Roberts, whose 6ft 4in, 17tst 5lb frame has moved from wing to centre since his 2008 debut Grand Slam season. "We're more than just size," says Cuthbert. "We've got a lot of skills - George showed that in that try in Ireland [with that] out of the back-door [pass to Jonathan Davies] and we've got a lot more to give."